Vornys Mindbender: Moons of Muniper! What is that thing? Captain Dokari: By the look of it, i'd say it's a giant undead owlbear. Rval: Aye! An' by the smell of it, too. Ardaw: Gee. Another horrifying undead creature. No problem; our cleric can just turn it. Oh wait! Our cleric is neutrally aligned. He can't turn anything! Banque: Again with this? I told you, Ardaw. If you don't like my Goddess, you are welcome to refuse her healing the next time you have an orc blade stuck in your gut. Captain Dokari: Oh. Right. Hello, Thrain. Not running off with your crew? Thrain: No ma'am. I have been trained to follow orders. I'm not like them. Captain Dokari: Well, I guess we'd better go help out. Oh! Malouf: This monster is dead. *throws a partially rotted giant owlbear head to Dokari's feet* Captain Dokari, you honor us by allowing us to attack it on our own. Lieralyn: Yeah, seriously. Thanks a lot. Hmph! And so it goes as Havoc Company and their guests travel deeper in to the Underdark, following the path that they used before. When they reach the point where they previously rescued Thydor, Malouf bends to the ground, sniffs around, and waves the group ahead down a path mostly hidden by an outcrop of rock. Several battles later (some of which Havoc Company even get to participate in), Qikko begins waving frantically. Qikko: Ok, i got something. Just up ahead a bit, a group of humanoids that definitely contains some Mind Flayers. Malouf: I follow your lead, Captain Dokari. Captain Dokari: Uh-huh. Ok, everyone. Quietly follow me. Qikko and Mindbender have us covered. Think happy thoughts and try to remember who your friends are. Ardaw: Arghhhh! My brain is on fire! Banque: Did we win? Did we win? Qikko: All i can remember is Lieralyn trying to pull one of my arms off. Lieralyn: It wasn't my fault! Captain Dokari: We drove them off, anyway. Thudlok: Look! We killed one! Ardaw: Hey, did one of those Mind Flayers look a lot bigger than the rest of them? Captain Dokari: Yes. It looked to be the same size as that guy Regan that we saw bossing around the Gelfini workers when we left this morning. Malouf: Do you think they are aligned? Could this all be a ruse to lead us away from Gelfini? Captain Dokari: I don't know. They split up. The big one went that way. Most of the others went the other way. Rval, what's in the direction the larger group went? Rval: Ach, it's a wee bit disorientin' down here. But if i have me mind on straight, that way goes ta the Drow city of T'lindhet. Captain Dokari: Ok, I don't want us going near Drow. Make sure you map accurately; if we run into Snow's group we can show them where those Mind Flayers went and they can go that way with Flerm. We'll follow the big one. A little later, Havoc Company runs into the Motley Crew. They exchange notes, and realize the big Mind Flayer may have been the one responsible for the world-shrinking, which is what the Motley Crew are in the Underdark to stop. Since Havoc Company are after the group that is responsible for raising the Elder God, they realize they have to double back and follow the other group that went to the Drow city. But they'll need Flerm for that. Alana also wants to go to the Drow city because "they might have good arrows". Lieralyn says she's not going anywhere near the Drow, citing personal reasons, so she rejoins the Motley Crew. And Malouf is needed to track the larger Mind Flayer. Adarra, however, isn't letting the adorable Qikko out of her sight. Kurtis: Doo doo doo doo doo. My three day excursion into the woods searching for rare mushrooms sure was fun. But it's time to get back to the group. Wait... what's happened to Gelfini???! Brecaryn: I'm in my lab. Flerm: Oh there you are. Brecaryn: What do you want, Flerm? Flerm: Why didn't you answer me when i called? Are you hiding in here? Ugh, what is that smell? What are you doing in here? Brecaryn: What. Do. You. Want?! Flerm: Sheesh. Why are you always so angry? Anyway, i heard you talking to Josy after the thing with the Mind Flayers. When they switched minds with us? And Josy said that her De-Spell Magic spell didn't work? Flerm: Uh-huh. And you said that the Mind Flayers' powers are sonic and not magic and that's why there was nothing to De-Spell? Flerm: Why are you just repeating what i'm saying? Brecaryn: What is your question, Flerm? Flerm: Well, i have this helmet, see? And it's supposed to protect me from mental attacks. And it worked against the Kopru. And i've heard you say that the Kopru are just primitive Mind Flayers? Flerm: So why didn't it work against the Mind Flayers? Brecaryn: Flerm, that's... actually a really good question. Brecaryn: Give me the helmet. Flerm: What? No! It's mine. Flerm: Oh. Ok. Here. But you'd better give it back. Flerm: Hey, that's disgusting! Don't put that on my helmet! Brecaryn: Shh. Ok, i see what happened. Look at this. Flerm: Yeah, you made my helmet gross. Thanks. Brecaryn: No, you see? That pattern of psychic residue. Your helmet did work! Flerm: No it didn't! My mind got put into a Mind Flayer body, remember? And Alana wound up in my head? Or part of her, or something. Brecaryn: Right, exactly. But do you think that's what the Mind Flayers wanted to happen? Why would they want us controlling their bodies? They must have been trying to do something else, maybe take control of us, and instead your helmet caused a backlash and mixed up all our minds. Flerm: Ahhhh! So i actually saved the day! Without me, we would have all become Mind Flayer slaves! Brecaryn: That's about the most self-serving way of putting it, but your helmet did foil the Mind Flayers and prevent us from being completely taken over by them. It wasn't exactly a complete victory. Theodore Dobbins did die in that fight. Flerm: Who? Is that one of the new minions? I can't keep track of them. And Josy brought him back, so what's the problem? If it wasn't for my helmet, we'd all be dead. Or slaves. Or dead slaves. Brecaryn: *Sigh* Yes, Flerm. If it wasn't for your helmet, we might have all been mind controlled by the Mind Flayers. Brecaryn: [to herself] He won't think he's so awesome when he takes off that helmet and finds his hair full of Grell brains. Found with a corpse in the lower levels of the Irate Volcano Island. My assumption is that these floating masses of horror are related to Beholders. After all, they are floating blobs of flesh covered in eyestalks. But how or if the two species diverged is not something I'm able to determined and in fact despite the obvious similarities I have seen no other documents commenting on them. To be fair, I haven't found much documentation on the Deepspawn at all; mostly snippets in tomes stolen from the Mind flayers, and the Illithid language is notoriously hard to translate. I suppose I should focus on the differences. 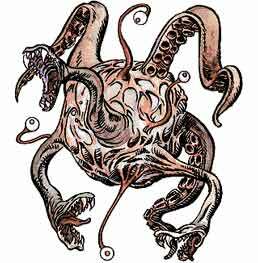 Deepspawn are almost three times as large as Beholders and they have a mass of octopus-style tentacles and snake-mouth tentacles in addition to the eye stalks. They also have no central eye and or mouth. Their eyes don't have special powers the way Beholders do, and in fact the Deepspawn do not have the deadly powers like Death, Disintegration, or Petrification that are shot from the eyes of the Beholder. Between that and the lack of the central eye's anti-magic ray, they are decidedly easier to kill despite their larger size. They are, however, highly resistant to magic - spells have less than a 1/3rd chance of affecting them. Since they don't have spells, their primary means of attack is actually through their opponents. The octopus tentacles have a hypnotic effect, lulling their victims into a state of passiveness. What happens next is pretty amazing: they take their opponents weapons while wrapping up their subdued opponents in their arms. They then use the weapons to attack any other opponents. Since Deepspawn live in remote, hard to get places, the weapons of their opponents are usually of the highly powerful and dangerous type, and having those weapons turns against your own party is a terrible thing. Meanwhile, they squeeze their captured opponents to death. The hypnotic effect only lasts a few seconds, but it requires a feat of great strength to break free. Each tentacle can grab two man-sized opponents, and they'll squeeze them to death in a couple of minutes. The snake tentacles are of course poisonous, and the Deepspawn are also immune to all forms of poison. While the eyestalks don't have specific magical powers, the Deepspawn do have access to a few magical abilities, including ESP and the ability to nearly fully Heal themselves once per day. Deepspawn have genius level intelligence and should be highly respected. All of the above simply makes them dangerous. For the purposes of my *ahem* masters, what follows is the important bit. Deepspawn consume anything organic (although they prefer fresh meat), and somewhere between once and three times per day, they can spawn a clone of any creature that they've ever devoured, provided that they've consumed enough mass. The clones are exact replicas of the original creatures and can't be detected as anything other than the original creature in any way, except for the fact that they remain completely loyal to the Deepspawn. They follow orders from their "parent" (by the aforementioned ESP when necessary) and can never be compelled to attack their progenitors even by the most powerful magical means. This ability is rarely useful in immediate combat, but a single Deepspawn can make an abandoned ruin, cave network, etc., a fully inhabited deathtrap in a few short weeks. Obviously this is of great interest to my masters, and so I've been isolated here in my volcano trying to figure out how to best take advantage of it. Through some bargaining and threats and some heavy dropping of my masters' names, I've managed to acquire three of the beasties from the Mind Flayers, who normally exterminate the creatures on sight (or rather, have given orders to do so to their Drow slaves) thanks to the Deepspawn's spawning ability, which can clutter up the Underdark right quick. They were of course mighty suspicious of my desire to keep some of them alive, and it was an expensive and risky proposition getting these three. I still wish I had been able to capture more. Because obviously we're going to want a lot more than three. I am unsure how they reproduce, so on the chance that they aren't asexual (who can tell?) my hope was to capture at least one of each gender. But of course I have no idea if I've done so. And to make matters worse, holding genius-level creatures prisoner is no easy task, and we had to kill one when it escaped (and nearly killed me). So I am down to two, and so far they've moved to occupy opposite ends of the volcano and have made no attempts to communicate (at least in person, remembering their ESP), let alone get it on. And other than emitting waves of pure hatred, they won't communicate with me. So the idea of getting one to eat the other and start spawning clones of it is also right out. I'm now looking into magical means of copying the two captives, but I left Alkeziem's Tome of Surreptitious Duplication on the mainland, and the masters won't let me leave the island because I have to watch over the Baatezu guarding the Furnace or I guess they'll wander in and burn themselves up or something. Honestly, the Furnace has turned out to be a huge distraction and waste of resources. When I first stumbled upon it I was pretty glad that the masters were pleased with me, but they've nearly forgotten the bigger picture because of it and I've kind of been at a loss for direction since then (I don't normally leave my important books behind). So I've had to send Barbados to get Alkeziem's book and of course that leaves me pretty nervous since he was pretty important in dealing with the Deepspawn that escaped. Big axe beats spells when you're dealing with a creature mostly resistant to magic, after all. We've been keeping the creatures underfed so that they can't spawn any more, but that just is making them hungrier and more desperate. I've considered bringing down a dragon to guard me, but the Orb of Dragon Control is being stretched to the limit as it is. I can barely get them to keep tolerating each other and I suspect being in close contact with a human will bring my control of them to the breaking point. So I just have to sit tight and hope Barbados gets back soon. Found after the first battle with Erintrah. My minions' foray into the Oblivion King's deserted castle has paid off. Those that managed to return brought back a cache of notes. Information on a strange poison (the Lich called it "bacteria") that modified the nature of zombies was of no interest to me, and I sold it to the hag Crulicar in exchange for materials necessary for my experiments. My focus was on the Oblivion King's research into an indestructible golem (he ultimately rejects that word, but his early notes use it and I will continue to), referred to as "Vain". Research into the golem's origins suggests something of "Daemonic" power (note a deliberate variation on the word "Demon"; unclear). The phrase "Ur-vile" is also used. I however have little interest in the origins. There are two matters of much more practical concern. The first is the ability to construct lesser versions of these golems, following notes from the Lich's. Materials are costly, and the result is somewhat useful but considering the expense there is no great value compared to hunting and capturing fodder as needed. I will continue to see if I can improve upon the formula. A possible avenue to explore for that dovetails with the second matter, and that is the ability to control the original golem. The Lich had some ideas in that matter although his notes don't say if he had the opportunity to try them, or if they were successful. My plan, therefore, is to lure the golem into a test environment which will allow me to observe the creature, perhaps even obtaining a sample. This might help with the creation of my own golems. And it will also give me an opportunity to try the Oblivion King's controlling method, which would of course render my plans much simpler. My spies tell me that the group that slayed the Oblivion King and controls the golem creature has moved to a previously unoccupied territory in the Five Kingdoms that just serendipitously enough houses a major opening to the Underdark. I can therefore clear out a suitable area, acquire various fodder to populate it with, and bring the group in for the experiment. The Lich's research states and my spies confirm that the golem follows a member of the group but that she is unable to actually control it. However, she and the remainder of the group is quite powerful, evidenced by their disposal of the Lich. Best case scenario, the group will die and I will have full access to the original golem. But I shan't hope for that; more likely I will simply get the opportunity to observe and improve upon the Lich's schemes in this area. The traveler in the Border Ethereal can move through solid matter in the plane s/he borders without ill effects in most cases. However, certain objects on the Prime Material Plane can present barriers. Certain spells can detect and ban the ethereal. Dense metals will have enough presence in the ethereal world to prevent movement. And the same is true for living beings. It should also be noted that certain creatures' effects can reach the Ethereal Plane. The touch of the undead, for example, reaches to the Ethereal Plane. For some reason, creatures known for petrification also all affect those in ethereal form. Therefore, the stare of a medusa or basilisk, the noxious breath of a gorgon, and the peck of a cockatrice all remain a concern to the ethereal traveler. Thanks to this, those concerned about Ethereal travelers have researched an alchemic mixture containing gorgon's blood that will, when mixed with the mortar of a building, prevent ethereal creatures from passing through the walls. Doors and passageways would still present a problem, but this can be countered with the use of guards, since living beings all emit an aura that, from the Prime Material Plane, will block travelers in the Ethereal. Because of this, an ethereal traveler can not materialize partially inside the body of an opponent, or leave a weapon where it will rematerialize into a living creature. And travelers also cannot pass through a guard standing in the Prime plane. It should be noted that this aura is not restricted to animals. Plant life also generates a life aura. Therefore, a vine-covered cottage is as immune to ethereal travelers as a castle build with gorgon's blood mixed into the mortar. This is worth mentioning since the gorgon elixir can cost over 10,000 gp with a reputable alchemist to produce enough for a medium-sized stronghold, and that's not counting the acquisition of the gorgon blood. Also let me know if you intend to create a new character for this session. Q: If this is the first time we're hearing about this, how can there be an FAQ already? A: While the Five Kingdoms are far more advanced than the southern lands that you come from, they have suffered from constant inter-kingdom war. There has been an uneasy peace for the past four decades, but the last war left a disputed territory that no kingdom controls. That area has become a safe zone for monsters and criminals, and we need a neutral party to clean up the area and then administer it. Here is a map of the Five Kingdoms. Q: Why doesn't one of the Kingdoms send in troops to take care of things there? A: All five of the Kingdoms have a claim on the land, so if any Kingdom sent in troops, the others would consider it an act of war. The Kingdoms don't trust each other enough for a joint venture. Q: Who used to own the Disputed Territory? A: Each of the continental Kingdoms shares a border with the area and in the past their borders extended into what is now known as the Disputed Territory. 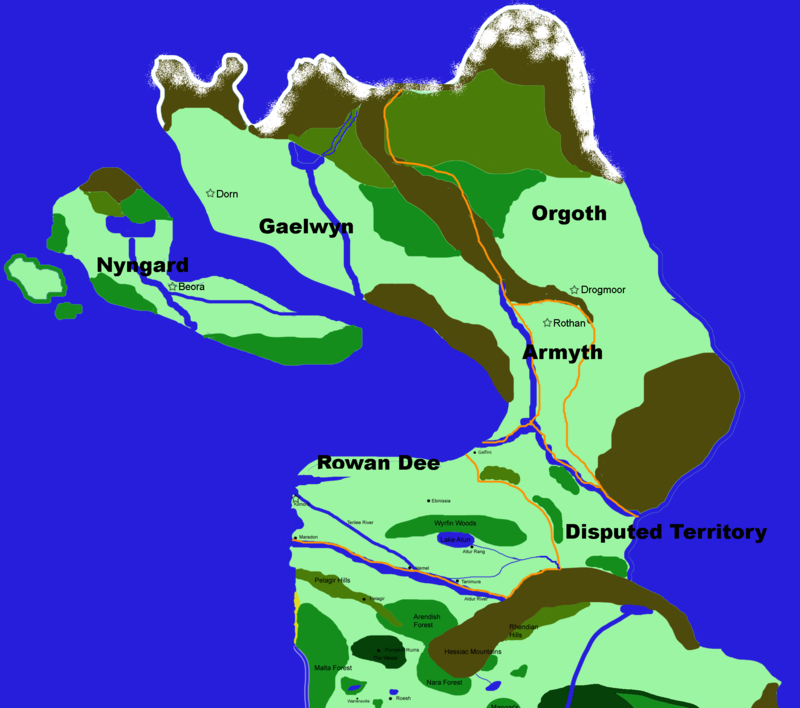 Additionally, the island Kingdom of Nyngard had sent settlers there some 300 years ago, establishing the village of Gelfini, which is the largest human settlement in the territory. So all of the Five Kingdoms have controlled some or all of the territory in the past. There is no clear former owner. Q: Won't one or all of the Kingdoms move to reclaim the territory once we clear the monsters out? A: All of the Kingdoms possess sufficient power to clear the area. The issue is that none of the Kingdoms want to threaten the fragile peace that has existed for the past 40 years. Clearing out the monsters won't change that dynamic. The rulers of each of the Five Kingdoms have issued sworn statements vowing to accept the stewards of this land as independent rulers. Q: Why not reach out to another established Kingdom for help, like Lord Phantar or Queen Morwyn? A: It was considered but it's felt that bringing in another established ruler simply increases the risk of an outbreak of war. Now there is another political faction to deal with. Some parties also do not have faith in the ruling capabilities of those leaders, based on their relatively primitive kingdoms and the number of crises that have occurred in their lands over the years (which were usually resolved by you). A: You have proven that you can handle the threats you will face in the Disputed Territory without the help of a large army. You've also proven yourselves capable of diplomacy by uniting various factions to help in the Oblivion War. And your actions have shown you to be a trustworthy group. With your power you could have taken whatever you've wanted by force, but instead you've devoted yourselves to solving the problems of your lands. Q: Who lives in the Disputed Territory now? A: It is largely unsettled frontier land. You will find some ruins of past attempts to establish settlements that were destroyed by war or monsters. The village of Gelfini is the largest human settlement. In general, the land is only occupied by a small number of farmers and fishermen, many of whom have loyalties to their various countries of origin and some who are not particularly loyal to any of the Five Kingdoms. You will also find some criminal groups, which we expect you to deal with. Q: You mentioned that Gelfini was founded 300 years ago. That is almost as old as the entire kingdom of Chumera! How old are the Five Kingdoms? A: By our reckoning it is the year 1068, but in fact our scholars know that our civilizations have been around longer than that. Q: Will the Kingdoms interfere with our rule of the Territory? A: Each Kingdom will provide an initial donation to fund the construction of a castle and then every year provide a small stipend to help with upkeep as well as the maintenance of a small armed force. You will not be allowed to amass an army larger than necessary for keeping the peace in your territory. You may tax your citizens and establish policies within your borders as you see fit. The river system on your northern border is an important trade route and you must not restrict access to any of the Kingdoms. You must not establish trade policies that favor one Kingdom over any of the others. You may not form alliances with any of the Kingdoms. Besides those basic restrictions, the Kingdoms will not want to interfere with your rule. The goals of keeping the land from going wild and maintaining the peace are greater than worrying about how you run your territory. Q: We've noticed that there are few demi-humans in the Kingdoms, and those that we've seen seem unhappy. A: There have indeed been problems with demi-humans in the past. Centuries ago, the Kingdoms went through a period of purging, destroying all monsters and fantastical creatures in the land in order to make things safer for humans, and the rulers became overzealous and extended that purging to elves, dwarves, and other creatures as well. This has been recognized as a mistake, and you will see non-humans among my own ruling party [two elves and a dwarf sitting at the table wave at you]. But the old wounds heal slowly. The fact that your group consists mostly of non-humans is not a coincidence; we see that as a way to make amends for past mistakes. Q: What about this dragon? A: The dragon is an ancient red dragon, most likely bigger than any dragons you've seen in the past. It came from the Disputed Territory but has taken up residence near my capital and is causing much havoc in my land. I will personally accompany you on this quest. Killing it is a final test of your abilities, and will also be great sport. Q: I've heard that you used to rule a microscopic kingdom with an iron fist and even built yourself a centaur body. A: I'm sure you're confusing me with someone else; possibly someone without a 'd' in their name. Q: Do you have any magical weapons you can give us? Q: Do you know a master bowman? Here is a simplified history of what the party has learned about Cervantes. Cervantes was a pirate that lived about 200 years ago. He was the scourge of the seas in the ancient days, and was rumored to have supernatural powers relating to his famed magic sword, the Soul Calibur. One day, he captured a noblewoman named Maria from a northern country called Rowan Dee, intending to hold her for ransom. One of Cervantes' lieutenants, Michael, fell in love with Maria. He fled with her, but not before replacing the Soul Calibur with a fake. Michael worked with a gnome named Wunderbar to break the magic sword into a number of pieces and hide them throughout the known world. Wunderbar also placed traps and puzzles in the hiding places. Eventually Michael's treachery was discovered and he and members of the crew loyal to him were trapped in one of the hiding spots. Cervantes was not aware that the sword was split into pieces, however, and he was unable to recover his sword, so he left Michael there to die. Michael and Maria's love for each other was so great that it continued even unto death, and both became ghosts. Maria was living in the town of South Luka, and her spirit continues to haunt its streets. Michael's restless spirit, trapped in the cave in the foothills of the Rusty Mountains, caused the entire cave to become a spawning ground for undead. Brecaryn has a map that shows the possible remaining locations of the sword's location. Before disappearing, Beeblebrox told Brecaryn that it's important that she get the sword pieces in order to prevent anyone else from doing so. The Motley Crew inherited the first piece of the sword - half the sword hilt - from Lashtal & Chyekk's group. That hilt was found in a swampy pit near Betaya. The Crew found the second half of the hilt in a pirate den in one of the smaller islands that surround the Isle of Dread. It's possible these pirates were descendants of the pirates loyal to Michael, or perhaps another rival pirate gang. The Crew attempted to find the hilt gem in the cave where Michael's ghost resides, but failed. It is thought that the Motley Crew's rivals, the Havoc Company, subsequently located the gem, but that is unconfirmed. Havoc Company was hired by an unknown employer. The Crew found another piece, half of the sword blade, in a cavern underneath a pyramid in the Great Desert. The cavern had been overrun by demons, which destroyed most of Wunderbar's traps. The party did not learn why the demons had taken up residence there. The Motley Crew encountered a gnome named Wunderbar working out of the city of Yokel as a magical blacksmith. Gnomes are long-lived, so it's possibly the same one that was allied with Michael. Searching through the Oblivion King's former home in Altar, the Crew finds this journal. While magical potions are intended to be taken orally, experimentation has shown that intravenous injection ensures the effect is not diluted by stomach acids, and therefore doubles potency. Repeated use of this method, however, causes the body to build up a resistance that eventually makes oral usage ineffective. Therefore, while not to be a regular habit, it is useful during a time of great need. Of course, during those times, utilizing an injection device is rarely feasible. Perhaps one could devise a suppository... ... Comparatively, the other Elders are astronomically beyond the others in Altar. But to me, they are like simpletons. How I long for an intellectual equal... ... The insufferable prying of the troublemaking curate at the Temple of Bast has become a nuisance I shall no longer tolerate. I shall kill two birds with one stone. Nal-Ugubis's death will also rid me of this... Balingal. ... With the administration of troll blood, a person could graft a third arm to their body. While, for anatomical reasons, the arm may not be functional, it should still allow a person to wield a third magical ring, thus providing a loophole to that frustrating fact that wearing two rings on one hand always cause the two to cancel each other out. ... My knowledge increases daily, and yet I have no one with which to share my discoveries... ... ...virginal blood obtained by the latest Ritual of Cleansing has been instrumental in confirming the principles of Mordenkainen... ... ...replicas of a golem I read passing reference to in a missive while doing research on Gaxx. The indestructible nature and oddly passive behavior caught my attention. I paid handsomely for a group of Zhentilians to investigate the area referenced but they found only a charred broken piece of wood preserved in a handsome chest. If it ever was something, it is now inert and provides no further clues. No more was to be learned. The duplicates, if they exist, should prove interesting. ... It is unknown why the ancient mage Bigby seemed to focus exclusively on hand-like manifestations. But studying the arcana behind the spells, I have discovered a unified principle that could be applied to all such evocations. Unfortunately, my time on this earthly realm grows short. If only I could find the means to extend my life beyond that which the Zhentilian Fountain has already granted me. Found in the ruins of Altar, the information here could help identify the Oblivion King. With his true name, he can be called away while his phylactery is destroyed. Excerpts from an old moldy pad with many pages that are torn or rotten. Most of the readable text describes mundane meeting notes from townhall sessions: records of weddings, petty crimes, trade agreements, etc. What follows are the items that may be of interest. "...in accordance with the wishes of the Elders, three virgins have been selected for the ritual of cleansing. Family members protested until they were reminded of their duty to..."
"...claims that the death of nal-Ugubis have angered the Gods are denied by the Elders and all of the High Priests. Curate Balingal defrocked, banished." "...complains of a stench emanating from..."
"...commemoration of Clock Tower upon completion at harvest..."
"...stench noticeable throughout town. Checking previous minutes, it was determined that first complaints of stench were in the Qsal sector. Elders have denied inspection." "...Elder council agrees to address the stench issue. Three virgins have been selected for the ritual of cleansing..."
"...claimed that Balingal's revelation proves that the entire council had been under the influence of an enchantment. All Elders furiously deny such charges..."
"...question of Baraju kul Nesa's death so soon after his decision to revoke Curate Balingal's banishment..."
"...has returned worse than before and accompanied by a dampness of soil that rots plants and wood and... Lama Balingal led protests against... cleansing. Elder al-Tufail sent by council to remind... of the great success of... ritual before the Clock Tower... On Balingal's orders, al-Tufail is held by a crowd of supporters. Balingal performs... results in al-Tufail's death. Balingal claims... al-Tufail.... has been dead for some time.... claim is preposterous." "...Lama Balingal's death in the temple of Bast has only increased the power..."
"...Council reduced to two members. Elder Anis seen wandering aimlessly in the Qsal sector. Did not recognize..."
"...as ordered by Dar as-Sabtah, townhall meetings will no longer be held until Balingal's ... can be exorcised from...Temple of Bast and Altar restored from spoilage."